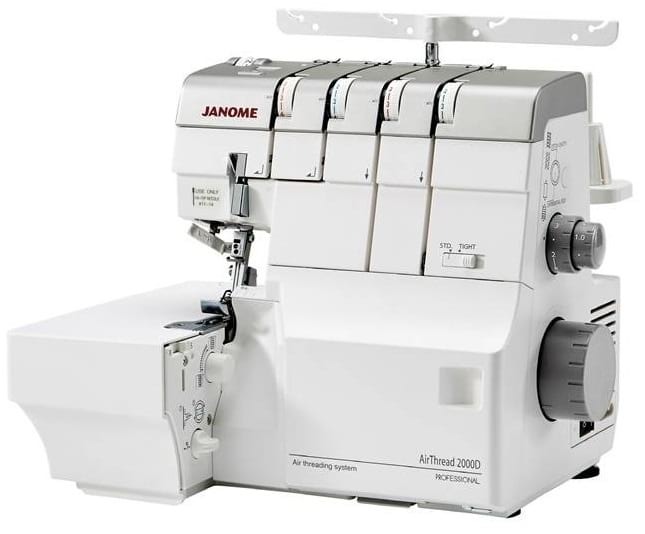 The Janome AirThread 2000D Professional is the newest top of line heavy duty Janome Overlocker. 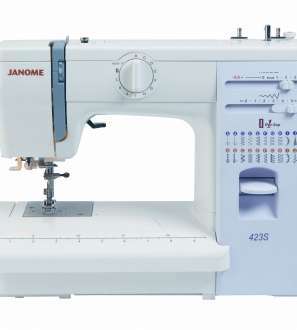 The Janome AT2000D is a 2 needle, 2/3/4 thread convertible Overlocker with Janome Air Threading. Just one push of a button a blast of air, threads your Overlocker as quick as a blink of an eye. This Air threader is equipped with a full spectrum LED light allowing you to see thread colours in the same way as outdoor lighting. Aberdeen Sewing Machines provides brand new machines with full manufacturer’s guarantee and support. Please note that against any new machine purchase from Aberdeen Sewing Machines we welcome Part Exchanges & are able to price match existing offers call 01224 478555 for more details. Just one push of a button a blast of air, threads your Overlocker as quick as a blink of an eye. This Air threader is equipped with a full spectrum LED light allowing you to see thread colours in the same way as outdoor lighting. 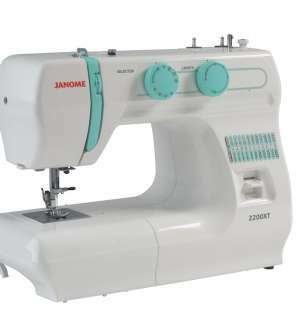 The 2000D is equipped with extra-large air thread loopers, an ultra-easy rolled hem, large tension disks, advanced differential feed, adjustable cutting width. 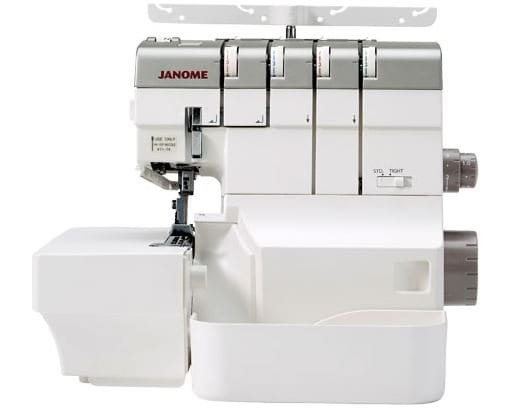 The largest high travel Janome cutting blades, and solid cast aluminum metal frame. The AT2000D is also equipped with an extra-large 8 feed dog feeding system capable of feeding every fabric with ease including poler fleece. 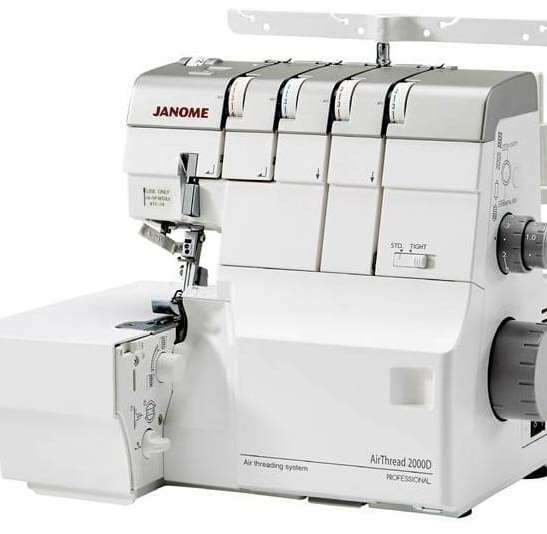 The Motor on the Janome air Overlocker is specially designed to give maximum piercing power and control over difficult fabrics, and at the same time the 2000D is the most energy efficient of any serger in Janome history. Tedious threading of upper and lower loopers are a thing of the past. Simply insert thread into the specially designed ports and your thread is transported to where it needs to be with an easy push of a lever. With strategically placed feed dogs in eight locations, the AT2000D will easily grab and feed your fabric. From slinky knits to denim, the AT2000D will meet the challenges of your sewing projects. Changing from a 3-thread to a 2-thread application has never been easier! Simply place your finger under the converter and flip it into position. Now, you’re ready to sew delicate rolled hems or reduce the bulk in your overlock edge. 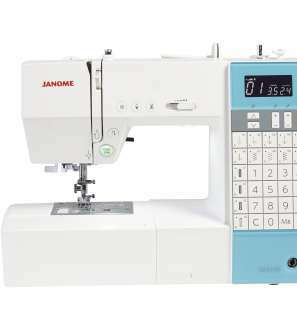 A Janome first! 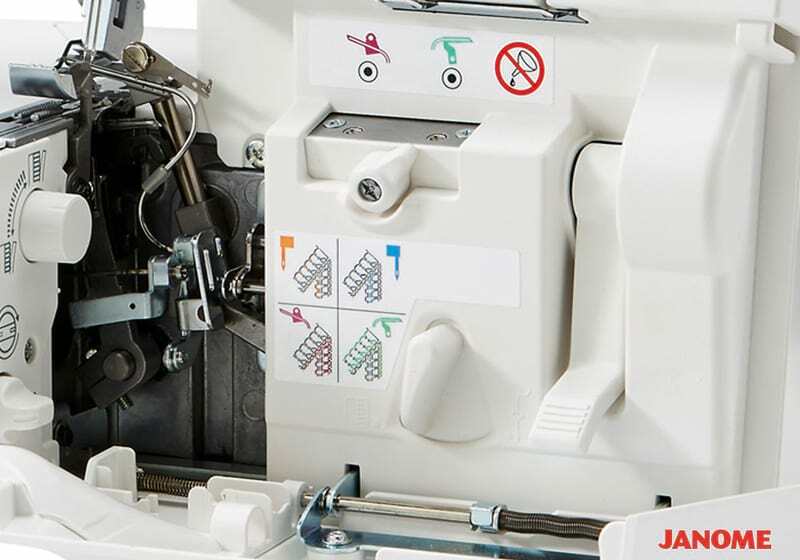 With a built-in needle threader, manually threading your serger needles is a thing of the past. One unit provides easy threading of both the right and left position needles. There are three micro-switches for added safety to the sewist. The AirThread 2000D will only be able to serge if all three switches (located in the side cover, looper cover and the Presser foot bar) are engaged. The Stitch Length Adjustment and Differential Feed Adjustment have been integrated into 1 dual function dial. Easily grip the textured dials to change your stitch length any time (even while sewing) to get stitches between 1.0-5.0mm. The unique differential feed device prevents fabrics from puckering, lets you adjust the stretchiness of our stitching as you sew, and enables you add ready-to-wear effects to your sewing. Adjustable from 0.5-2.0mm. Easily make adjustments to cutting width, access the upper knife release knob and switch to rolled hemming in one easy slide of the stitch finger lever. All of these adjustments are now located on the right side of the sewing bed for ease of operation. The main shaft is newly redesign in the AirThread 2000D. Two ball bearings provide low torque, giving you greater stability at higher serging speeds and the benefit of added durability. Serge through bigger projects with the wide flat work space. 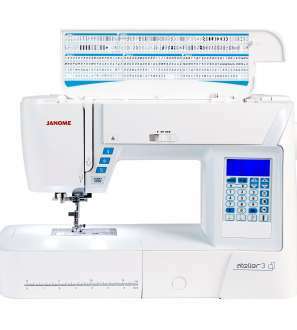 The AirThread 2000D offers ample sewing area with a sewing bed of 4.65” wide in front of the serging needle and 5.59” wide behind the needle. The bed is 9.67” deep as well. With improved slide-and-go thread guides, quickly and easily lay the thread in place. 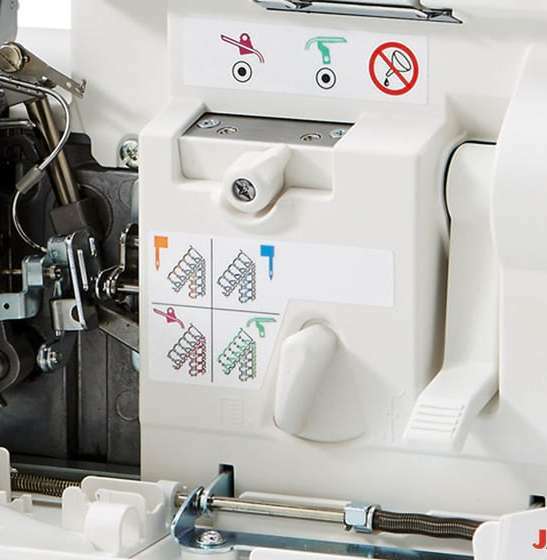 The slide-and-go thread guides take the guess work out of threading the upper tension discs – preventing errors in threading the machine correctly. Easily adjust the foot pressure to accommodate sewing on a variety of fabrics, or to accommodate optional accessory feet. Our comprehensive Sales Services are second to none. If you find the same product at a lower price up to 14 days after purchase, we will happily match it or refund the difference*. Visitors can take advantage of a demonstration of the latest sewing machines and hands on tutorials. Our friendly team members are more than happy to answer any of your questions before, during, and after the sales process.